Wednesday January 1st 1896 I did sweeping and cleaned up the house this morning. Seth went to the valley for wood and it was late when we got dinner over. Will and I went in town to bring Father & Mother out. It was not cold today. They came with us. I got supper over. I knit all the evening and visited with Mother. Will Chalfont is very sick. 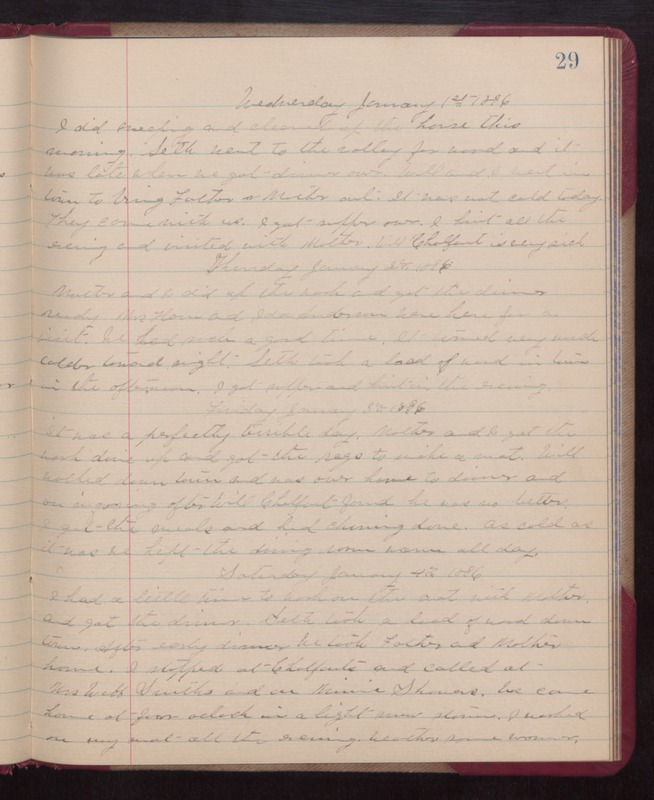 Thursday January 2nd 1896 Mother and I did up the work and got the dinner ready. Mrs. Howe and Ida Anderson were here for a visit. We had such a good time. It turned very much colder toward night. Seth took a load of wood in town in the afternoon. I got supper and knit in the evening. Friday January 3rd 1896 It was a perfectly terrible day. Mother and I got the work done up and got the rags to make a mat. Will walked down town and was over home to dinner and on inquiring after Will Chalfont found he was no better. I got the meals and had churning done. As cold as it was we kept the dining room warm all day. Saturday January 4th 1896 I had a little time to work on the mat with Mother, and got the dinner. Seth took a load of wood down town. After early dinner we took Father and Mother home. I stopped at Chalfonts and called at Mrs Webb Smiths and on Minnie Showers. We came home at four oclock in a light snow storm. I worked on my mat all the evening. Weather some warmer.